Applicants intending to immigrate to Canada will now have an accurate idea of the length of processing that their application may take for PR programs. These include the Provincial Nominee Programs, Quebec Skilled Worker Program, the Entrepreneur Start-Up Program, and the Parent and Grandparent Program. Presently processing time for all Canadian PR applications was retrospective, and showed the time it took to process 80 percent of applications that were submitted in the past. IRCC also has anticipation that the new method used for projection of processing time will successfully provide an accurate estimate to the applicants. The new system means applicants will know the time IRCC will take for most applications under normal circumstances if there is a submission today. Moreover, after this change, IRCC can estimate how long the new PR applications will take depending on factors like the number of current applications in queue for processing and the volume of admissions permitted each year under the existing Immigration Plan. Ahmed Hussen Minister of Immigration, Canada says that the focus is on improving the service experience of clients. 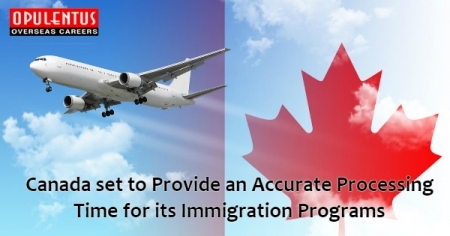 This update will also ensure the accuracy of the processing time for immigration. Moreover, it helps clients to prepare better in moving to Canada when the application is approved. Additionally in the past years there was significant progress to reduce the processing time across many categories seeking canada permanent residents. Moreover, there is an increasing demand for all types of permits and visas. Owing to the multi-year increase in immigration level, this improvement was possible. Furthermore, this allowed advance planning, implementation of intake control, and also the use of innovative new processes in IRCC offices located within and outside Canada. There is a slight alteration to check processing times in the online tool. This is regarding the projected processing time based on the user selecting the options of - I have not applied yet or affirming the applying. Decrease in processing times appears only marginal, but it reflects the goal of reducing the processing times of the government. Regarding the Express Entry applicants, the processing time is six months. This target is realized in a majority of cases since 2015. IRCC also stresses that the applicants need not re-apply as it will not result in a fast processing time. Waiting for the course of events is a better option for all existing applicants.